Stuck on physics homework? Ask a physics question and we'll match you with an expert tutor who can help. The best part? Our physics tutors are available anytime, anywhere. 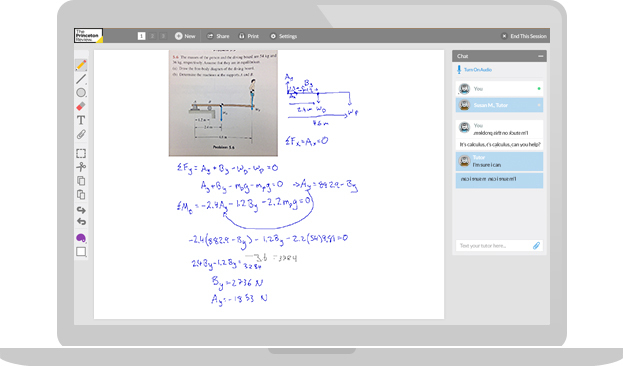 Log on when it’s convenient and connect with a physics tutor instantly. Ask a specific physics question, review for your next test, or get help with a tricky topic. Watch how it works. Our online classroom is equipped with all the tools you need to ask your physics questions and get them answered. You can upload your lab reports, discuss physics problems using the chat feature, or draw graphs on the interactive whiteboard. Finish your physics homework faster, and get the grades you deserve. From AP® Physics to intro college courses, we've got you covered.